I don’t know about you, but I’ve been astonished at how the idea of metadata has broken into popular culture. This is entirely due to the revelations about the U.S. National Security Administration’s widespread electronic surveillance programs. For the first time, vast numbers of ordinary folk are learning about the concept of metadata. Since this is a subject that concerns self-publishers, but which doesn’t come up in conversation very often, it has been interesting to see people struggle with the difference between data—like the conversation you have on the phone with a friend—and data about that data (or metadata)—like all the details of that phone conversation that have nothing to do with the content. Maybe you talked about a party you’re both planning to go to. That’s the data that made up the content of your phone call. Metadata includes things like your phone number, the number you dialed, the date, time, and duration of the call, and so on. Even before digitization created the world of metadata that we live in today, there were primitive forms of metadata that helped publishers sell books. 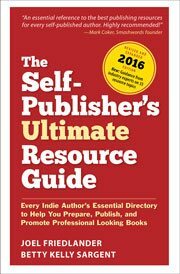 One of the simplest of these forms is the category publishers assign their books to. Traditionally printed on the back cover of a trade paperback, this tells booksellers where to shelve the book so buyers can find it. That’s a pretty useful piece of information to have about a book, and still one of the most important pieces of metadata. Get this wrong, and it can make your book less discoverable to online searches. But the gradual process of digitization itself—of music, photographs, artwork, books, typefaces, and a whole lot more—has stimulated the use of metadata. After all, if a photograph, a type font, and a book are all reduced to a digital file, how are you supposed to keep them all straight? As digitization continues its inexorable colonization of the real world, metadata will become more and more important. Even now, we are living in a world of metadata, and we should probably get used to it, because that way we can use it to sift through the seemingly endless torrent of content of all kinds that is constantly coming at us. At its most basic, you could see the act of “tagging” or using hashtags in your social media updates as a simple way of assigning metadata, allowing them to be searched and aggregated. And you just have to look around to see the way metadata has intruded into many ordinary places. It used to be you took a photo, you got it “developed” and that was it. A print or negative you could hold in your hand. Look at this (partial) metadata record of an ordinary iPhone snapshot (from Adobe Bridge). And that doesn’t include the many fields you can create and populate yourself for your own metadata uses. Or how about font metadata? Fonts started out as collections of metal letters, which became mechanized and then digitized in film before being translated into digital file formats. So learn to think about metadata. Learn the keywords that are most frequently used by your readers when they are looking for the kind of things you write. When it comes time to create titles, subtitles, and rich descriptions for your books and other products, you’ll know a lot more about how to optimize them for searchers. And that’s one of the biggest payoffs for authors who take the time to learn about metadata: your books will be more discoverable, and found by more people. That’s the result we’re looking for. Want to dive in and learn more about metadata, specifically for your books? Here’s a collection of resources to get you started. Photo credit: sarah0s via photopin cc. Amazon links contain my affiliate code. I love it whenever you delve into metadata on your blog, Joel. This is a subject I definitely need to learn about. Now I need to brush up on some of the resources you list here. Thanks for a great post. Thanks, Joel. Any research on what specific metadata (besides Category) authors should focus one? Sorry – i just saw the set of links you provided! The link to the NSA matters. I suspect most people don’t know all the data that’s being added to that picture they’ve taken by their camera, smartphone or software. Imagine the Gestapo breaking up a Danish resistance group that publishes an underground paper, acquiring the originals of the photos that ran in the paper. In the technology of 1944, those originals would tell them almost nothing. With today’s metadata, the Gestapo would discover a lot about who took it, when and where. The same is true of photos posted online. Michael, I was thinking something similar when I was looking at the geo-location information that was captured along with the rest of the data. Something to ponder, for sure, but it doesn’t look like we’ll ever be going back to that simpler time. I was just updating cover copy on several of my books last night. And, lo and behold! I discovered that I’d accidentally put one of them in the category historical fiction. No, no, no! It’s historical fantasy. Not sure how that slip occurred, but I’m glad I discovered it. Some of the readers of historical fiction might like Livli’s Gift, but those readers actually searching for historical fantasy would have never found it. Lesson: review meta data at regular intervals to double check that it’s correct! Absolutely. Great tip, thanks for that. I’m of the opinion that the most important metadata for Jane and Joe writer exists in the keywords we send to Amazon included within our titles, subtitles categories, keywords they provide and perhaps lastly (dead last) in the description. I’m not convinced the metadata we can add to our documents, e.g. tags, does much during a Kindle search. Jason, thanks for that. Yes, the higher the level of metadata, the more important it seems to be. Starting with your categories is the best idea, since many readers search by genre, and you want to be where your readers are looking. BTW- regarding my previous comment- yes, I am off to read each of the links to other metadata resources you’ve listed. But what is hard to believe is that I’ve been researching this for a while – and I keep coming up with so empty handed and with so little usable information that I can’t imagine what I am doing wrong. LOL! I feel that no one less than Edward Snowden can help! Karen, I hope you do click through, because these articles contain practical, step by step information you can use for your own book projects. You might want to start with the “Introduction to Metadata” article, but the others will also have useful tools for you. Any questions, leave them here in the comments. How timely! I spent last evening in a state of clueless frustration, staring at the kdp upload screen asking for keywords for my book. Joel, for children’s picture books – where can I view & research the keywords other children’s authors enter so that I can learn how to do it for myself? Many thanks! Pretty interesting, but not quite what I need to know. I want to know if the metadata embedded in my word files and pdf’s proves I wrote the book or paper and guarantees the date I wrote it. That’s my interest in metadata. Virtually every modern file format has embedded metadata tags for authorship, time stamps, and other related information. When you create a PDF, that information is usually embedded. That said, the metadata can be changed or overwritten without any kind of file copy protection, in many cases, if someone is intent on doing it. So if you are looking for a “digital signature” to prove ownership/origin of a document, you might want to investigate file security schemes, or certificates.